Time away to focus and make your relationship a priority. Reliable methods to resolve cycles of frustration, blame and loneliness. Exercises to deepen your intimate connection. 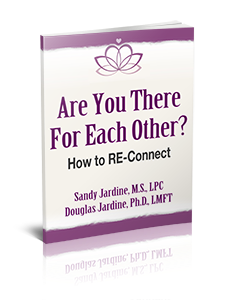 This workshop is based on the book, Hold Me Tight: Seven Conversations for a Lifetime of Love, by Dr. Sue Johnson. It is designed to benefit couples of all types and in many different situations. It can help whether you are married, living together, committed or considering commitment. You can be struggling, doing well (and wanting more), or in a rut and want to get more out of your relationship. All couple exercises are done in private, group sharing is optional. The Keeping Love Alive workshop can be very helpful for couples who have never had counseling or for those currently in counseling who want to accelerate their process of healing and change. It is also highly recommended for couples in the helping professions who want to strengthen their own relationship at the same time they strengthen their skills. This workshop is designed to help couples cope with the emotional and sexual issues that arise from the diagnosis and treatment of prostate cancer. It will include frank discussions, specific coping tools, and very practical resources. The workshop is led by Douglas and Sandy, who are both therapists and veterans of the prostate cancer experience. It is emotionally safe, confidential and supportive. Drawing on the diverse spiritual interests of those who sign up, this workshop provides skills and experiences to transform the spiritual lives of participants. There is no spiritual or religious agenda except mutual respect and deepening and growing the spiritual experience of those who sign up. Based on the experiences of a group that Sandy conducted for 13 years, this workshop is designed for individuals and couples already committed to a spiritual path as well as for those still seeking. It is designed to take you closer to where you want to go and to deepen the spiritual experiences of where you already are. All workshops are co-lead by Sandy and Douglas. This provides a balance of male/female energies and the creative interaction of a wife/husband therapist team. Check back often for our new workshops and groups. For more information and pre-registration, call Sandy at 480-990-9128. For a complete listing of the workshops we provide, see our Workshops & Groups page for upcoming offerings.